Raymondville: Inside the Largest Immigration Prison Camp in the U.S. | Democracy Now! immigration lawyer from Harlingen, Texas. She represents immigrants held at Raymondville. The number of undocumented immigrants currently imprisoned in the United States has reached a record of more than 26,000 people. To keep pace with the increasing number of detainees, the government is rapidly expanding its federal immigration detention system. The largest immigrant prison camp is in Raymondville, Texas, in the remote southern tip of the state. Some 2,000 undocumented immigrants are currently being held in the prison awaiting deportation. The $65 million jail was built last summer by the Management Training Corporation. The Washington Post describes the Raymondville facility as a “futuristic tent city … made of Kevlar-like material” without windows and ringed by barbed wire. Many of those being held there say they have insufficient food, clothing, medical care and access to the outside world. Jodi Goodwin is an immigration lawyer from Harlingen, Texas, about 20 miles from the Raymondville prison. She represents a number of immigrants being held there. She joins us on the line from Houston. AMY GOODMAN: Staying with the immigration issue for another minute, we’re going to go now to Jodi Goodwin, who is an immigration lawyer from Harlingen, Texas, about 20 miles from the Raymondville prison, that huge tent city. She represents a number of immigrants being held there. She’s joining us on the phone today from Houston. Jodi Goodwin, you’re one of the few lawyers who have gotten into the facility. Can you describe what it is? JODI GOODWIN: Well, it looks like a large series of circus tents put up in the middle of a field. There’s a cement foundation and a steel frame, like ribs, and then there’s canvas that’s stretched over the steel frame. And there’s 10 tents just like that, all in a row. JUAN GONZALEZ: Jodi Goodwin, I’m very familiar with Raymondville and Willacy County. It’s one of the poorest counties in the United States, largely Mexican-American. Any sense of the reaction of the surrounding community to the erection of this enormous detention center? JODI GOODWIN: Well, it’s interesting, the reaction of the community, because it’s mixed. It is one of the poorest counties in the United States, and the Rio Grande Valley in general in the five-county area is the poorest area in the United States. So the thought of vast employment, which the prison did provide, I think, was welcomed by the community, because it provided a wealth of jobs for an area that has high unemployment. Now, there’s questions about the training that was available prior to the prison opening and, even still, you know, whether or not the people that were hired have appropriate training as of yet. AMY GOODMAN: Can you talk about the people you represent in Raymondville — you call, what is it that you call it? Ritmo? JODI GOODWIN: Now made famous by The Washington Post, yeah. AMY GOODMAN: Taking after Gitmo, Guantanamo. What kind of access to food, to healthcare? What is their treatment by the guards? JODI GOODWIN: Well, I think generally the access to healthcare is good. But there have been rampant reports and repeated reports — and I can’t say whether these are isolated incidences or not, but there are repeated reports of my clients and other people that I’ve talked to at the detention center that aren’t my clients, that indicate they would put in requests for sick calls to be seen by a doctor or one of the nurses at the public health service, and days would go by before those requests would be answered. Now, I know that ICE has responded to those types of complaints by saying that that’s just not true, but I have heard repeatedly from my clients and those who are not my clients that that’s the case. I’ve also heard repeatedly and over time that food service is not consistent, in terms of the timing that food is served, that the quantity of the food that is being served is not fulfilling. I mean, I went to the detention center once about probably the last part of November last year, and I walked into one of the pods, and I just opened the door and said, ”Buenos dias. Como estan todos?” And they responded to me, ”Muriendo de hambre” — “We’re dying of hunger.” And, you know, this is just their immediate reaction to someone coming in and asking, “How are you?” Now, ICE has responded that they are providing food within the caloric limit that’s approved by dietary services, etc., etc. But even recently, as most recently as two weeks ago, I had a client write to me a pleading letter asking for medical attention and decent food, because he had been served rancid milk days in a row, and he and other detainees in his pod were throwing up and had stomach problems, because they had been served spoiled food. So, you know, for whatever that’s worth, I know ICE’s comments are completely opposite to that, but that’s what the reports that I get from my clients and from detainees there are. JUAN GONZALEZ: Jodi Goodwin, any sense of how long the average detainee is being held there? Clearly, after the Mariel boat lift years ago, or decades ago now, some of the Cuban migrants were held for years in detention by United States Immigration. What’s the situation there? JODI GOODWIN: Well, you know, it’s interesting, because the facility went up so quickly. It was contracted in mid-June, and it was housing 500 detainees by mid-August. It was at least designed to be a temporary facility, and I’m not really sure what’s the number limitation that ICE would use to refer to “temporary,” but I’ve seen many, many people detained at the facility two, three, four, five months, and then there are people that are detained at the facility that have been transferred around the country and eventually end up in Willacy County, probably because it’s cheaper to house detainees down in Willacy County than it is in places like New York or Boston. 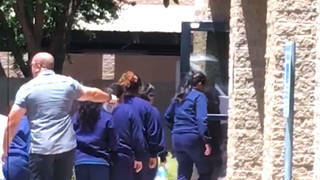 But I’ve seen those people that come into Willacy County after already having been in immigration detention in various facilities around the country five, six months. I saw a woman from Ghana that had been transferred around from five different facilities in an eight-month period of time, and she was supposedly only waiting to be deported. So why does it take eight months in five facilities to deport somebody to Ghana? I’m not really sure. AMY GOODMAN: Can we talk for a minute about who built this facility, Management Corporation of America, a private company, and how it compares to the public prisons or the ones run by the Department of Homeland Security? JODI GOODWIN: Well, actually, Management Training Corporation is a contractor who runs [inaudible] the operations at the facility. It was a different contractor who actually constructed the facility, and I can’t remember the name of that contractor. It was a contractor out of Houston, actually. And as far as how does it compare to ICE-run facilities? Oh, night and day. We have an ICE-run facility that’s a fairly large detention center that’s only about 45 minutes away from the Raymondville facility. That’s the Port Isabel Detention Center, and that’s an ICE-run facility, as opposed to a contractor-run facility. And you compare the two, and Port Isabel is Club Med compared to Raymondville. In fact, when there’s discipline problems or when someone starts complaining about their conditions at Port Isabel, almost as a joke, but really and truly it’s not taken in jest, they say, “Do you want me to send you to Willacy?” You know, that people would rather stay at Port Isabel than be sent to Willacy. AMY GOODMAN: What do you think, Jodi Goodwin, has to happen right now? JODI GOODWIN: We need immigration reform. I think that there needs to be a comprehensive approach to reform. And, you know, reform has to encompass a lot of different aspects. We can’t just settle on a guest-worker program. We can’t just focus on enforcement. The reform aspect needs to encompass the people who are here, needs to encompass the need of American companies for workers. It needs to encompass enforcement and just enforcement of the law. It needs to have all of those aspects to be able to be effective. And I have my hopes that Congress can set aside some of their partisanship and do something that will actually work good and be acceptable to both sides of the issue. JUAN GONZALEZ: And what is your sense in a state like Texas and the other border states in your part of the country that clearly most feel the impact of the immigration issue, in terms of the willingness of both Democrats and Republicans this year to come up with some comprehensive immigration reform? JODI GOODWIN: Well, it’s interesting. I’ve met with staffers in Washington, D.C., and talked to different representatives and senators with respect to the proposals. I think that there’s a clear recognition by all of the border representatives in Congress that there’s a problem and it needs to be dealt with. And the mere fact that they’re willing to start a dialogue on the issue, I think, is hopeful. It’s gotten to a point that it’s a crisis situation, so those individuals are, I think, finally realizing that they need to take action, now that they’ve recognized the issue. AMY GOODMAN: Jodi Goodwin, I want to thank you for being with us, immigration lawyer from Harlingen, Texas, representing immigrants held in the Raymondville prison, about 20 miles from Harlingen. She was speaking to us from Houston. And then there’s the federal raids, like at the Swift packing plant, the local crackdowns, the gutted due process, the web of suspicion, the rise of hate. JUAN GONZALEZ: Well, I think the reality is that, yes, there was a lot of attention last year, but nothing really emerged in terms of comprehensive immigration reform, and I do not see at this stage that there is any momentum, already in this new year, by this new Congress, to address the immigration issue, and I think it’s going to clearly necessitate another upsurge of mass protest to be able to even put it on the agenda, and I suspect that this spring we’re going to see more of that. AMY GOODMAN: I mean, it’s interesting that the main goal of people who are organizing the protest was just to stop any immigration legislation from passing, because they felt in a Republican Congress there could only be trouble. And yet, now the Democrats are in power. What have they done, and is it on their agenda? JUAN GONZALEZ: No. As I said, I don’t think it is right now, and I think it’s going to necessitate both the corporations who are increasingly realizing the necessity to have comprehensive immigration reform, as well as a mass movement and the labor movement to put it on the agenda, because, otherwise, with the war and the other major issues confronting the country right now, it’s going to continue to be pushed back in terms of addressing what is clearly needed as some kind of comprehensive immigration reform. AMY GOODMAN: Well, we’re going to link to your story on the NYU protest: “Find an Illegal Immigrant.” The Republican club held it, and hundreds of students then wore little notes on them that said “illegal immigrant.” Is that right?